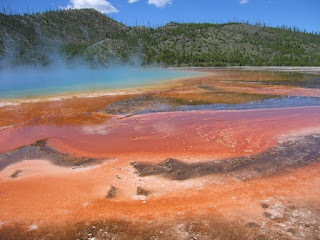 Yellowstone is home to half of the world’s hydrothermal features, over 10,000 in total. Around 300 are actual geysers. 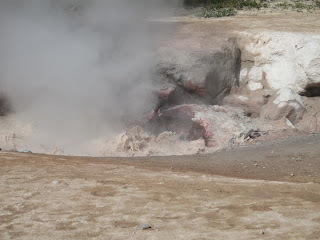 Mudpots, hot springs and fumeroles make up the other 9,700! So what is a mud pot and a fumerole? Here are some examples we see along our hikes on our North to Yellowstone adventure to help you sort out the differences. First, it is important to understand that Yellowstone sits on a big caldera, or super-volcano. Water, from melting snow and rain seeps through fissures and cracks in the earth and eventually comes in contact with super heated rocks and magma about 10,000 feet below the surface. Under extreme pressure the heated water finds its way back to the surface in various ways depending on the natural “plumbing” in the immediate area. Hot Springs are the most prevalent feature in the park. 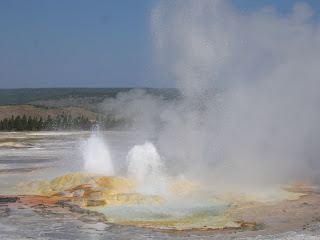 The water surfaces under some pressure, but not enough to cause a spouting geyser. These features are often very colorful because of thermophiles or bacteria mats that live in them. Different thermophiles live at different temperatures and produce different colors. 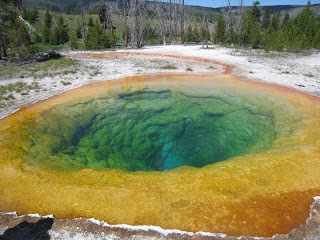 My favorite hot spring is Morning Glory, but probably the most famous one is Grand Prismatic. Geysers are basically hot springs with constricted “plumbing” closer to the surface. Pressure builds up and eventually releases in the form of steam and bubbling or spouting water. 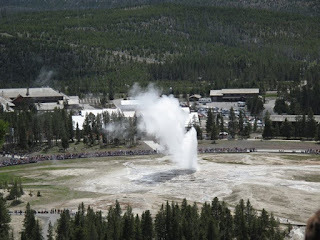 The most famous of these of course is Old Faithful spouting off about every 70 minutes reaching 90-184 feet in the air, but others are actually bigger like Steamboat which can reach over 300 feet, but it is very unpredictable. Other geysers go off every few minutes, some, every few days. 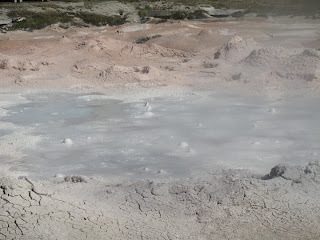 Where water is limited, but sulfuric acid content high, bubbling Mudpots form. The acid dissolves the surrounding rock to form a think mud. Some of these can be a bit smelly, but it is fun to watch the mud shoot up in the air! 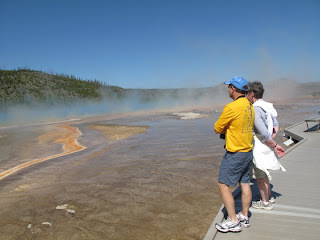 Hot springs where the water is so hot that it boils away before reaching the surface make steam vents called Fumeroles. They hiss and growl like angry dragons! Yellowstone is truly a magical place, full of wildlife and mystery. 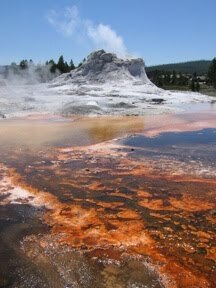 For more information on the hydrothermal features, check out the Yellowstone web site or join us for a North to Yellowstone adventure and see them in person!